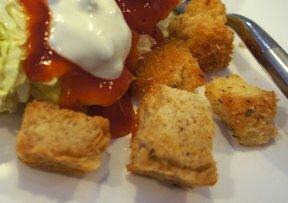 These crunchy croutons can be served all on their own as a snack. You'll be lucky to have any left before the salad or soup is served. In an ungreased 9x13 inch baking pan, combine the first 7 ingredients. Place in a 300° oven until butter is melted. Remove from the oven; stir to combine. 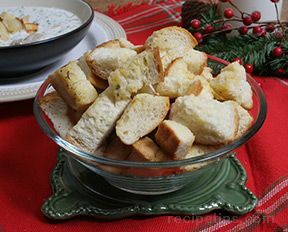 Add the bread cubes and toss to coat. 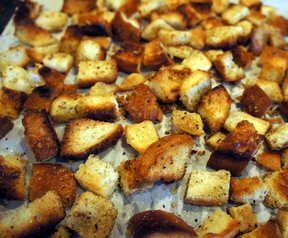 Bake for 10-15 minutes or until bread is lightly browned, stirring frequently; Cool. 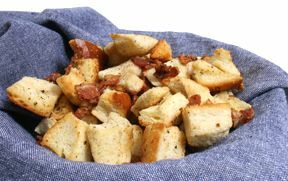 Store croutons in an air tight container. "You will never buy them in the store again. I add Lawry's salt, too. These are a treat at our house...who needs the salad to go with them!"